I love open-world games with plenty of people to meet, talk to and get quests from. The downside of such games is that I spend way too much time exploring and detract from the main quest. 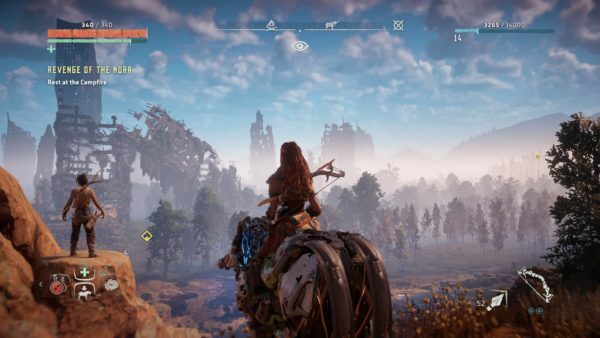 Horizon Zero Dawn (HZD) on the PlayStation 4 is no exception – the game is huge and interesting in so many levels that it’s hard to stop playing. After spending over 50 hours exploring the map, talking to and helping people, destroying machines, running errands, completing side quests and collecting rare artifacts, I still feel there is a lot more to go. Set in a world far into the apocalyptic future where mechanical creatures roam the lands like wild animals, where remnants of our civilisation lie in ruins overrun with vegetation, and humans are living primitively in tribes in simple settlements, HZD’s interesting environment fills you with dread about the past that feels futuristic, foreboding and yet so familiar. Is this the real life? Is this just fantasy? 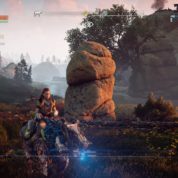 HZD’s story is thought-provoking and intriguing. SCREENSHOT: Yap Hui Bin. 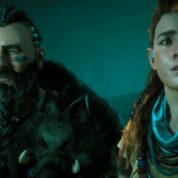 The game opens with Aloy, the female protagonist, as a child, learning how to hunt and survive on the wild with her father, Rost. 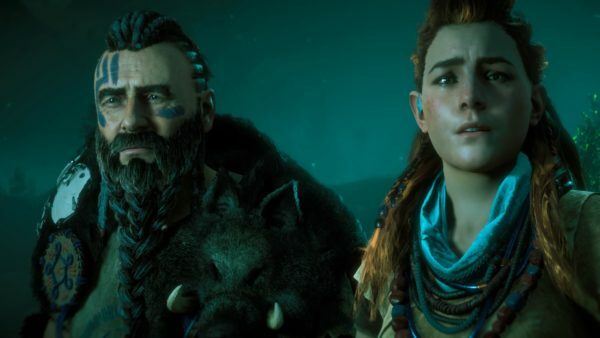 Living on their own in the wild as they were casted out from the Nora tribe, and without a mother, Aloy has a very close relationship with her father. Aloy spent her formative years training for “The Proving”, which will give her a chance to rejoin the tribe if she succeeds. 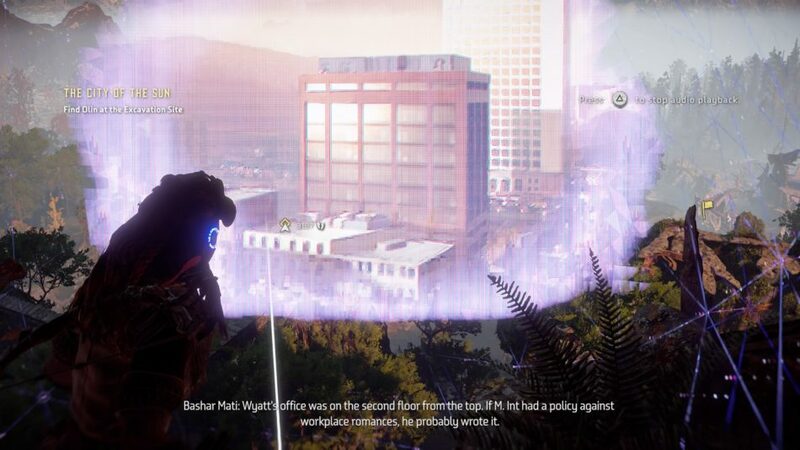 On one occasion, she fell into a mysterious ruin which is a bunker filled with corpses of people from the past and found a Focus, a piece of ancient technology that resembles a Bluetooth headset critical to the gameplay. 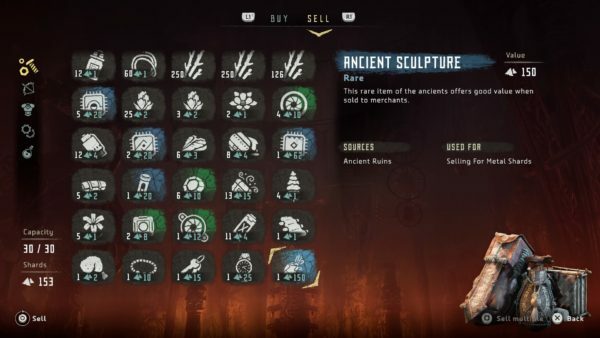 The Focus – triggered by pressing the right thumbstick – provides Aloy with an interface that lets her view the weaknesses and strengths of machines that she encounters, track people down, find machine and ancient debris to loot, listen and view data points left behind by the ancient people. She can even view certain Vantage points, so you can see how the ruins used to look in their former glory, superimposed over the current scenery. Aloy can use the Focus to view the past through Vantage points. SCREENSHOT: Yap Hui Bin. By juxtaposing technology and the primitiveness of humankind, HZD intrigues you to keep playing and unravel the mystery of what happened in the past that created this future. A great underlying message of discrimination in any form, be it status, tribal, gender, or religious, is cleverly woven into the game. Aloy’s strong character leads her to courageously break tradition, prove naysayers wrong and gain acceptance based on her own merit. You experience prejudice and discrimination and the cruelty of humans first hand when people Aloy meet called her “motherless outcast”, bully and sneer at her, and were forbidden to speak with her. And further in the game as Aloy grows up and finally gets accepted into the Nora tribe, she faces discrimination from other tribes for the “savage” tribe that she belongs to. When she goes out to prove her own worth, there are those who frown on women becoming soldiers or hunters. Despite that, Aloy meets plenty of women of all races in positions of power, which shows a lot more equality in her world than the views held by a small-minded few. 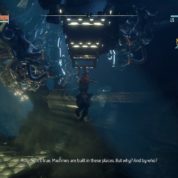 Aloy can override mechanical creatures and ride on them. SCREENSHOT: Yap Hui Bin. The world of HZD is filled with interesting people to meet who will ask Aloy to help them, send her on errands, and even request for her to use her Focus to do a little investigative work. There are also specialised merchants asking her to gather ancient collectibles like mugs (or what they called vessels), metal flowers that seem to serve as seed pods, and figurines from a reclusive tribe. Other than the side quests, there are lots to do. Gather ingredients from plants and animals to create potions and craft expansions for pouches and bags, projectile ammo and traps. Destroy machines and loot them for metal shards, which is used as the game’s currency for trading, as well as special parts that are used to trade for armour and weapons. Downed enemies also occasionally drop modifications that can be used to improve Aloy’s weapons and armour. 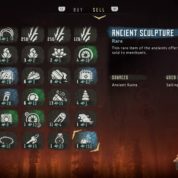 Aloy can also find ancient artifacts like bracelets, watches and keys that can be sold to merchants for shards. For those with a competitive streak, you can also take part in hunting trials to prove Aloy’s hunting prowess and earn medals that will let Aloy trade for weapons. Bracelet, keys, watches are considered ancient artifacts in Aloy’s world. SCREENSHOT: Yap Hui Bin. Aloy has several weapons at her disposal, including her trusty spear for close melee combat and for overriding machines, bows that can fire different types of arrows, slings for dealing wider splash damage and tripcasters that create tripwires to snag the unsuspecting target. Apart from fighting wild animals and machines, Aloy also has to deal with bandits and corrupted machines, which are more aggressive and dangerous than the regular ones. 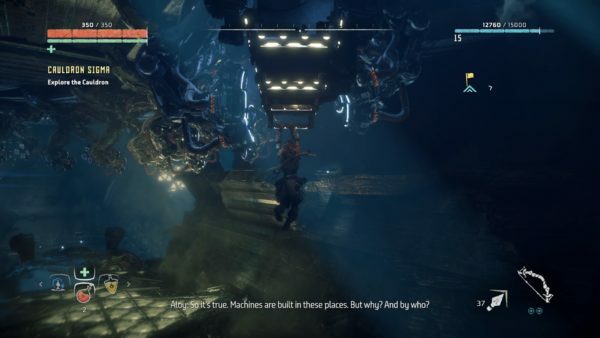 There are mysterious places called “cauldrons” where nightmarish machines are manufactured, and Aloy can get access to data on more machines that she can override. Overriding machines can be really useful – they will stop being hostile towards her and attack other machines and some can even be ridden by Aloy, which is great for travelling to faraway places and for running over wildlife. The futuristic/ancient Cauldron is is where the nightmarish mechanical creatures are made. SCREENSHOT: Yap Hui Bin. One complaint I have about HZD is that the close camera angles hinder melee battles – most of the time I cannot see where the enemy is and ended up whacking around blindly. 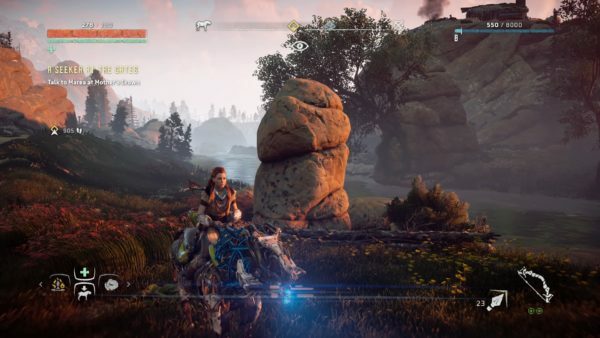 Also, the use of the D-pad interface to scroll through inventory and potions is extremely clumsy during the heat of the battle – I have accidentally called my mechanised steed, tossed a rock and used a wrong potion while trying to get Aloy to take a Health potion. Aloy can also gain skill points to upgrade her skills in the areas of Prowler, Brave or Forager, including a “bullet time” skill that slows time down when she is aiming with her bow, performing stealth takedown on enemies, notching multiple arrows, or gaining more items when she forages. 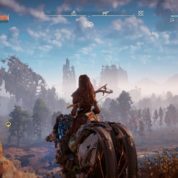 HZD’s dialogue is well written and professionally voiced, and conversations are usually quite interesting, offering much insight into the tribal differences, the hardship of the people and the conflicts that they struggle with. Occasionally you can choose Aloy’s responses based on whether she’s being tough, kind or smart, but I didn’t think that it has an impact on the overall story. Even Aloy’s little monologues make her feel more real as a character, expressing her thoughts, quirks and personality. Returning to the ancient bunker where she found the Focus during the childhood, she comments on how it’s been so long since she’s been there and if she can do something different now that she’s grown up. A wade in the river and she complains how she hates wet boots. Throughout her travels, Aloy also finds enigmatic audio and video data points left behind by the ancient people that offers bits of insight into the dystopian past, which sounds very much like what we can predict for our own futures. It’s great that you don’t have to read a wall of text to enjoy HZD’s deep story, and be constantly reminded about the ancients which gives you the impetus to find out more about what happened in Aloy’s world that mirrors so much of our own. One of the most striking thing about HZD is the truly magnificent and realistic graphics. 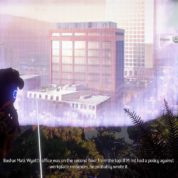 HZD’s beautiful scenery in the day and eerie landscapes lit by roaming machines in the night are truly mesmerising. The wild landscapes and villages are vividly depicted, as are the weather conditions like snow, rain and fog. The fearsome mechanical creatures are designed to look like the animals we know but with raw looking, almost skeletal physiology but have brightly lit eyes like headlights. Horizon Zero Dawn’s graphics of people are exquisite and stunning. SCREENSHOT: Yap Hui Bin. But what is really spectacular are how detailed the faces and features are of the people you meet. Every freckle and mark on faces is rendered in exquisite detail, costumes are beautifully designed and the movements feel completely natural. I did think that the wet sheen on people’s skins after the rain makes them look rather waxy but that might be just because everything else has been looking so realistic and natural so far. If you love to explore a great big open world rendered in stunning detail, enjoy games with a strong story, a protagonist with tough personality and unravelling the past and our possible future, and don’t mind getting terribly addicted in the process, I highly recommend HZD. HZD is currently going at S$52.43 on the PlayStation Store.